Francoska pesnica iz časa rensanse je bila hčerka bogatega vrvarja iz Lyona. Poznana je tudi po nadimku Lepa vrvarka. Skupaj z možem sta imela literarni salon, kjer so se zbirali znani lyonski pesniki in humanisti. Njena zbirka pesmi Œuvres je izšla leta 1555. French poet of the Renaissance born in Lyon, the daughter of wealthy ropemaker Pierre Charly. She is known also as La Belle Cordière (The Beautiful Ropemaker). She and her husband hosted a literary salon that included many of the renowned Lyonnais poets and humanists. Her poems Œuvres were printed in 1555. Francoska revolucionarka aktivna udeleženka oktobrske revolucije in ruske državljanske vojne je bila rojena v Franciji. Delala je kot učiteljica na Poljskem. Leta 1906 je postala članica komunistične partije. Leta 1918 je ustanovila francosko komunistično skupino v Moskvi. Bila je med organizatorji upora francoskih mornarjev na Črnem morju. Vendar so jo vojaki na predvečer upora ujeli in ustrelili. Polish disabled - the mouth and foot painting artist. Francoska političarka članica francoske veje delavske internacionale. Leta 1936 v času, ko ženske niso imele volilne pravice je bila skupaj z Cécile Brunschvicg in Irène Joliot-Curie (obe sta na znamki F-6478) ministrica v zvezi levih gibanj Front populaire. A French politician of French Section of the Workers' International. In 1936 she became one of three women ministers in the Front populaire (an alliance of left-wing movements), along with Cécile Brunschvicg and Irène Joliot-Curie (both on stamp F-6478), at a time when women could neither vote nor be elected. Belgijska slikarka je v letih 1975-79 študirala v Bruslju kjer tudi živi in ustvarja. Prvič je razstavljala leta 1980 svojo video skulpturo s povezanimi monitorji. Leta 1985 je dobila štipendijo za študij v Bostonu. Belgian painter, photo and video artist, from 1975–79 she studied at the Ecole Nationale Supérieure d´Architecture et des Arts Visuels «La Cambre» in Brüssel where she lives and works. In 1985 she got scholarship for Institute of Arts and Humanities in Boston. She exhibited for first her videosculpture with linked monitors in 1980. Svedska pisateljica je od 1897 delala kot svobodna pisateljica, leta 1914 je postala članica Švedske akademije. Kot ustvarjalka je bila moralistka, po slogu pa med neoromantiko in modernizmom. Za svoja dela je večkrat uporabila stare legende in pravljice. Njena glavna dela: Gosta Berling (1891), Antikristovi čudeži (1897), Jeruzalem (1901-2), otroški roman Čudovito potovanje Nilsa Holgerssona (1906-7). Leta 1909 je kot prva pisateljica prejela Nobelovo nagrado. Selma Ottiliana Lovisa Lagerlof, a Swedish novelist and short-story writer, was the first woman to be awarded the Nobel Prize for literature (1909). Her first literary success was The Story of Gosta Berling (1891), a saga written in a romantic style that characterized all her later works. The Miracles of Antichrist (1897) was a novel about socialism in Sicily. After a tour of Palestine, Lagerlof published Jerusalem (1901-02), a two-volume novel describing a settlement of Swedish farmers in Jerusalem. When Swedish school authorities commissioned her to write a Swedish geography, the result was The Wonderful Adventures of Nils (1907) and Further Adventures of Nils (1911). 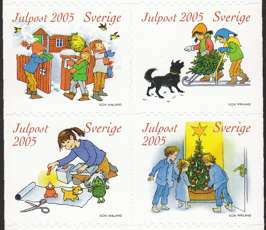 Describing a boy's journey through Sweden, it captured the imagination of children the world over. Finska ilustratorka in oblikovalka se ukvarja s slikarstvom in risarstvom. Na bloku FI-1970-1974 so tudi Lundsten Juliasten, Parika Minna, Katola Sanna, Santanen Jasmin in Laitinen Anna. She is finish ilustrator and graphic designer devoted to paintings and drawings. On sheet FI-1970-1974 are also Lundsten Juliasten, Parika Minna, Katola Sanna, Santanen Jasmin and Laitinen Anna. Maria je bila žena finskega dobrodelca Juho Lallukka. Bila sta bogata vendar brez otrok. Polovico svojega premoženja sta namenila ustanovitvi knjižnice v Vyborgu. Podpirala sta tudi umetnost. Maria Lallukka was wife of Juho Lallukka (1852-1913) the finish benefactor. They were very wealthy but they have no children. They specified half of their wealth to the establishment of the Vyborg library. They were patrons of the arts. Dark and exotic with extraordinary beauty and high IQ led La Marr to iconic film star status with a legion of fans. It was her wild private life which perhaps raised most interest; married six times, she enjoyed a wild love life which culminated in drug addiction and an early demise by a suspected overdose aged just 29. V Avstriji rojena ameriška fimska igralka (pravo ime Hedwig Eva Maria Kiesl) je igrala v številnih popularnih filmih ameriškega MGM studija. Manj pa je znano, da je tudi izumiteljica. Skupaj z Geogom Anthielom sta izumila napravo za spreminjanje radio frenkvenc med oddajnikom in sprejemnikom, kar je onemogočalo prisluškovanju pogovorov. Napravo je leta 1941 patentirala. She was an Austrian-born American actress known primarily for her celebrity in a film career as a major contract star of MGM's "Golden Age". With co-inventor George Anthiel, developed a "Secret Communications System" to help combat the Nazis in World War II. By manipulating radio frequencies at irregular intervals between transmission and reception, the invention formed an unbreakable code to prevent classified messages from being intercepted by enemy personnel. Grška igralka s pravim imenom Ellie Loukou. Študirala je na zasebni igralski šoli ene velikih grških igralk Marike Kotopouli in kmalu postala njena najljubša igralka. Svoj priimek je spremenila v Lambeti po knjigi Astrapogiannos avtorja Balaoritisa. Kmalu je postala znana igralka. Igrala je tudi v nekaterih filmih. She was a Greek actor born as Ellie Loukou. She studied at private school named after one great Greek actress Marika Kotopouli and soon became Kotopouli's favourite actrees. Loukou adopted the surname Lambeti, from a book named Astrapogiannos by the author Balaoritis. Soon she became lead actress, and she starred in plays like Hanneles Himmelfahrt by Hauptmann. She also played in some films. Na znamki NL-2287 je njena fotografija: Strastno. She is a Dutch fashion photographer known for her subversive approach to fashion and art photography. She studied at Amsterdam’s Art Academy. On stamp NL-2287 is her photo: Passionately. Nemška voditeljica ženskega gibanja je leta 1887 z izjavo pozvala naj se izobraževanje zaupa ženskam. Svoje ideje je sporočala v periodičnem časopisu Die Frau in v Handbuch der Frauenbewegung (1901-6). Njena izbrana propagandna dela so izdali v Kampfzeiten. She is a prominent educationist and feminist, urged in a memorandum of 1887 that the education of girls should be taken out of the hands of men and entrusted to women. Her ideas were expressed in the periodical Die Frau, founded in 1893, and in the Handbuch der Frauenbewegung (1901-6). A selection of her propagandist work appeared in Kampfzeiten. Je ena najbolj popularnih francoskih televizijskih napovedovalk v letih 1950 - 1970. Sodelovala je v različnih razvedrilnih programih, kot so C'est arrivé à 36 chandelles in La séquence du spectateur. Sodelovala je tudi pri kuharski oddaji Art et magie de la cuisine. Za svoje delo na francoski televiziji je bila odlikovana z Legion d'Honneur. She was a French television presenter and actress. She was probably the most popular lady presenter (speakerine) of French television, from the end of the 1950s through the 1970s. She took part in diverse light entertainment programmes in the years 1950-1960, such as "C'est arrivé à 36 chandelles" and "La séquence du spectateur" (later renamed "La séquence du téléspectateur"), as well as the cookery programme "Art et magie de la cuisine". She was awarded with the Légion d'honneur for her undeniable imprint on the history of French television. Nemška pisateljica otroških in mladinskih knjig je najbolj znana pa knjigah o zajcu Feliksu. Izdala je preko 60 knjig za otroke in mladoletnike, ki so prevedena v 29 jezikov. Svojo prvo knjigo je izdala leta 1989. A German author of children’s and young adults’ literature is primarily known for her best-selling picture book series about Felix, a traveling stuffed rabbit. She published over 60 children’s and young adult books, many have been translated into over 29 languages. Her first children’s book was published in 1989. On stamps: Letters from Felix. Nizozemska tekačica na srednjih progah je leta 1992 na olimpijskih igrah osvojila zlato medaljo na teku na 800 metrov. A former Dutch middle distance runner who specialized in the 800 meters won on 1992 Olympics gold medal. Slavna igralka, po svojem rojstnem kraju znana kot Jersey Lily (lilija iz Jerseyja) se je poročila s poslancem Ianom Malcolmom. Postala je ameriška državljanka. Na obeh straneh Atlantika je bila silno priljubljena. Posebno všeč je bila Edvardu VII., ki je pogosto, ko je bil še Waleški princ, obiskoval njene predstave, kadar je igrala v Londonu. Leta 1887 je sprejela državljanstvo ZDA, kjer je očarala številne znane osebnosti: Marka Twaina, Oscarja Wildea, Theodora Roosevelta in druge. She was born in the Old Rectory, St, Saviour, Jersey. She was nicknamed "Lillie", possibly because of the extreme whitness of her skin. She was educated at home. In 1874 she married Edward Langtry, a well-to-do young widower of Belfast. Moving to London, she became, overnight, the centre of widespread admiration and attention in high society as a result of her exceptionally good looks and vibrant personality. Certain difficulties over financial extravagance lead her to a stage career and, after a hesitant start, she made successful appearance as Kate Hardcastle in She Stoops to Conquer. She proceeded to star in many theatrical productions in Britain, USA and South Africa. She became an accomplished actress and a brilliant businesswoman with boundless enregy, drive and charm. In 1887 she became a naturalised American. Famous people (Mark Twain, Oscar Wilde, Theodore Roosevelt..) were captivated by her. Švedska likovna umetnica je leta 1992 magistrirala iz grafičnega oblikovanja in ilustracije na Konstfack umetniški univerzi v Stockholmu. Študirala je tudi na Rhode Island šoli za oblikovanja v ZDA. Swedish artist is graduated in 1992 from Konstfack University College of Art, Crafts and Design, Stockholm, with a master of Fine Arts degree in graphic design and illustration. She also studied at the Rhode Island School of Design, Providence, USA 1991. On stamp S-2342 is her poster for biological museum: Woodpecker. Francoska modna oblikovalka visoke mode je ustanovila modno hišo Lanvin ter družbo za lepoto in parfume Lanvin Parfums. She was a French haute coulture fashion designer. 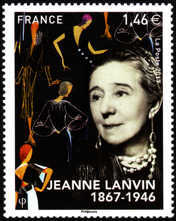 She founded the Lanvin fashion house and the beauty and perfume company Lanvin Parfums. Članica grške olimpijske water polo ekipe, ki je na OI 2004 v Atenah osvojila srebrno medaljo. She won silver medal OG 2004 Athene: greek water polo team. Njeno pravo ime Maria Elisabeth Lebzeltern. Po končani srednji šoli je študirala umetnost v Gradcu pri profesorju Rudolfu Szyskowitzu. Znani avstrijski slikar Oskar Kokoschka, ki ga je spoznala leta 1962 na poletni akademiji je zapustil trajen vtis na njeno slikarstvo in risanje. Upodabljala je razglede na Gradec, pokrajine južne Štajerske in svoje prve akte. Leta 1968 je začela z dolgo vrsto razstav na Dunaju, v Gradcu in Firencah. S svojo družino je prepotovala skoraj celo Evropo. Njeno hrepenenje po oddaljenih krajih pa jo je vodilo na Bali, Izrael, New York, Portoriko, Tajsko, Burmo, Laos, Kambodžo, Ekvador, Peru, Kitajsko, Nepal, Jemen, Japonsko in večkrat v Indijo. Dina Larot was born in Vienna as Maria Elisabeth Lebzeltern. After graduating from secondary school, she started studying art at Graz under Prof. Rudolf Szyskowitz. At the 1962 Summer Academy, she met the great Austrian painter Oskar Kokoschka, who left a lasting impression on her painting and drawing. She subsequently created views of the city of Graz, landscapes of southern Styria and her first nudes using models. In 1968 she began a long series of exhibitions in Vienna, Graz and Florence. While her travels with her family initially took her through almost the whole of Europe, her yearnings for the faraway later took Dina Larot to Bali, Israel, New York, Puerto Rico, Thailand, Burma, Laos, Cambodia, Ecuador, Peru, China, Nepal, Yemen, Japan and repeatedly to India. Islandska pisateljica in političarka je bila v letih 1930 - 1938 članica islandskega parlamenta. Icelandic author and politician was a member of Icelandic Parliament - Althingi, from 1930 to her death 1938. Nemška pesnica je pripadala krogu ekspresionistov, izrazito subjektivna čustvena lirika s tematiko ljubezenske strasti, pozneje izgnanske usode, revščina in staranje, Bila je tudi nadarjena risarka, ki je sama ilustrirala svoja dela. Ker je bila Judinja, je leta 1933 emigrirala v Švico, nato v Palestino, kjer je v revščini umrla. Pesniške zbirke: Styx (1902), Moji čudeži (1911), Hebrejske balade (1913) in Moj modri klavir (1912). Of Jewish parentage, Schüler settled in Berlin after her marriage to the physician Berthold Lasker in 1894. In Berlin she frequented avant-garde literary circles, and her lyric poems and short stories began appearing in periodicals. Her second marriage (1901-11) was to Herwarth Walden, the editor of a leading Expressionist journal. Her first book, a poetry collection entitled Styx (1902), was followed by Meine Wunder (1911; "My Miracles"), Hebräische Balladen (1913; "Hebrew Ballads"), and several other volumes of lyric poetry. Her other important works are the play Die Wupper (1909), the autobiographical novel Mein Herz (1912; "My Heart"), and the short stories collected in Der Prinz von Theben (1914; "The Prince of Thebes") and Der Wunderrabbiner von Barcelona (1921; "The Wonder Rabbi of Barcelona"). She emigrated to Switzerland in 1933 after the Nazis came to power in Germany, and in 1940 she resettled in Jerusalem in Palestine. She had always led an eccentric and unpredictable life, and she spent her last years in poverty. Lasker-Schüler's poems exploit a rich vein of fantasy and symbolism and alternate between pathos and ecstasy in their intensely personal evocation of her childhood and parents, romantic passion, art, religion, and other themes. Many of her short stories reinterpret Arabian nights tales in a mode of modern fantasy that is rich with visual images. Though rich in atmosphere and symbolism, her stories tend to have a weak narrative focus and little or no plot. Lasker-Schüler's reputation as an important German lyric poet of the early 20th century is assured, however. Avstrijska slikarka je študirala na Akademiji za likovno umetnost na Dunaju. Po diplomi leta 1945 se je vrnila v Celovec. V Parizu je prišla v stik z nadrealisti. Leta 1954 se je vrnila na Akademijo za likovno umetnost in zaključila akademsko usposabljanje. Delovala je v skupini umetnikov okoli Monsignora Otta Mauerje. Skupaj z Arnulfom Rainerje jo uvrščajo med ustanovitelje neformalnega slikarstva v Avstriji. V 60-tih letih je živela v glavnem v Parizu in New Yorku. Tam je naredila več kratkih risanih filmov. Leta 1980 je postala prva ženska v nemško govorečih državah profesorica slikarstva na dunajski Akademiji uporabnih umetnosti. Za svoja dela je prejela številne nagrade. Leta 1988 je kot prva umetnica je prejela avstrijsko državno nagrado. Prejela je nagrado Oskarja Kokoschke. Leta 2004 je prejela nagrado Max Beckmann mesta Frankfurt za svoje odlične dosežke. Leta 2005 pa ji je avstrijski predsednik podelil medaljo časti znanosti in umetnosti. Na znamki A-2715 je njena slika: Obramba. On stamp A-2715 is her painting: Defence. Na znamki UA-863 je njena slika: Sneženje. On stamp UA-863 is her painting: Snowing. Prva ženska uslužbenka pošte v Črni gori. The first female post clerk in Montenegro. Francoska slikarka in grafičarka je študirala slikanje na porcelan v Sevresu. Po vrnitvi v Pariz je nadaljevala šolanje na Académie Humbert, kjer se je navdušila na oljno slikarstvo. V zgodnjih letih 20. stoletja, je bila pomembna osebnost pariške avantgarde in članica kroga Pabla Picassa. Bila je prijateljica Picassoja in pesnika Guillauma Apollinaira, ki jo je imel za svojo muzo. Ustvarjala je slike, akvarele, risbe in grafike. Je ena redkih ženskih kubistk kot so bile Sonia Delaunay, Marie Vorobieff in Franciska Clausen. Njena dela kažejo vpliv kubističnih slikarjev Pabla Picassoja in Georgese Braqua. Razvila je edinstven pristop k abstrakciji, ki je pogosto osredotočen na predstavitev skupine žensk in ženskih portretov. Na znamki F-5289: Ženska s turbanom. Na znamki F-6619: Portret baronice Gourgaud v črni mantilli. Na znamki F-6620: Deklica s kitaro. 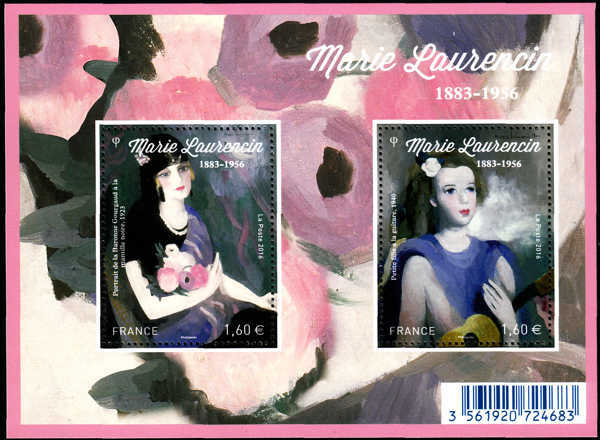 She was a French painter and printmaker. At 18, she studied porcelain painting in Sèvres. She then returned to Paris and continued her art education at the Académie Humbert, where she changed her focus to oil painting. During the early years of the 20th century, Laurencin was an important figure in the Parisian avant-garde and a member of the circle of Pablo Picasso. She became romantically involved with Picasso's friend, the poet Guillaume Apollinaire, and has often been identified as his muse. Laurencin's works include paintings, watercolors, drawings, and prints. She is known as one of the few female Cubist painters, with Sonia Delaunay, Marie Vorobieff, and Franciska Clausen. While her work shows the influence of Cubist painters Pablo Picasso and Georges Braque, who was her close friend, she developed a unique approach to abstraction which often centered on the representation of groups of women and female portraits. On stamp F-5289 A Woman with Turban. On stamp F-5289 Portrait of the Baroness Gourgaud with the black mantilla. On stamp F-5289 A Girlwith Guitar. Avstijska pisateljica zaradi stalno ponavljajoče bolezni ni mogla redno obiskovati šole, in ne delati težkih opravil. Po obdobju številnih depresij je začela pisati religiozna, mistična, filozofska in okultna dela. Njena prva objavljena knjiga - zgodba Otrok vsebuje številne avtobiografske poteze. Pesniška zbirka Die Bettlerschale (1956) jo je popeljala na pot uspeha. Zanjo je bila prvič nagrajena, številne nagrade pa so še sledile: Georg-Tracklova nagrada 1954 in 1964, nagrada Bavarske akademije za umetnost 1963, nagrada Antona Wildgansa 1964 in velika državna nagrada Avstrije za literaturo 1970. Christine Lavant could not attend school regularly because of recurring illness and was for the same reason never fit enough for heavy labour. After a period of severe depressions she turned to literature of religious, mystic, philosophic and occult kind. Her first book to be published was the story The Child with strong autobiographic traits. The collection of poetry Die Bettlerschale (1956) got her on the road to success and she was awarded her first prize with many others to follow: Georg-Trackl- Prize 1954 and 1964, Prize of the Bavarian Academy of Arts 1963. Anton Wildgans-Prize 1964 and the Great State-Prize of Austria for Literature 1970. Finska slikarka je študirala v Helsinkih. Na znamki je njena upodobitev deklice, ki kriči od veselja do življenja. Deklica simbolizira preteklost in prihodnost. 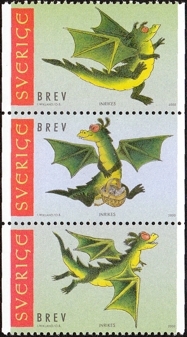 The stamp was designed by the Finnish artist Henrika Lax. She lives in Helsinki and Lemland in Ĺland. She explains her choice of stamp motif: The stamp shows a girl screaming out her joy of living. The little girl symbolizes the past and the future. Angleška arheologinja in antropologinja je odkrivala koščke kosti, zanimive delce fosilov in predzgodovinsko kamnito orodje. Več kot pol stoletja je igrala odločilno vlogo pri odkrivanju izvora človeštva. Pri tem je naletela na številne pomembne najdbe, kot je lobanja Avstralopitka boise ali odtis stopinj v Laetoli v Tanzaniji. Obisk jam v Franciji in arheološka izkopavanja v otroštvu so ji vzbudila zanimanje za paleolitsko arheologijo. Po tem ko so jo izključili iz dveh šol je začela obiskovati predavanja iz geologije na University College London in arheologije v Londonskem muzeju. Začela je risati najdbe iz arheoloških najdišč v Devonu. Leta 1933 je spoznala arheologa in prirodoslovca Loisa Laekeya, ki jo je špovabil naj ilustrira njegovo knjigo. Čez tri leta sta se poročila. Mary je postala ugledna poznavalka in proučevalka človeškega izvora. Archaelogist and antropologist. The voyages of discovery made by Mary Lekey could start with a scrab of bone, an interesting-looking fossil fragment, a prehistoric stone tool of rock art. For more than half a century, the archaeologist and palaeonthropologist played a key role in exploring the origins of humanity, which resulted in many significant finds, such as the hominid skull Australopithecus boisei and the Laetoli footprints in Tanznaia. Duting childhood archeological digs and visits to cave sites in France first sparked Mary`s interest in palaeolithic archaeology. After being expelled from two schools, ske began informally attending lectures in geology at University College LOndon and in archaeology at the London Museum. By the age of 17 she had begun drawing finds uncovered at dig sites in Devon, then in 1933, she met the archaeologist and naturalist Lois Leakey and she was invited to ilustrate one of his book. Three years later they were married and Mary went on establish an outstanding reputation in the study of human origins. Francoska filmska in gledališka igralka Ginette Le Clerc (rojena kot Geneviève Lucie Menut) je začela svojo filmsko kariero leta 1937. Znana pa je postala leta 1940 v filmih Le Corbeau (1942) in Il Fiacre N. 13 (1947), v katerem je igrala trojno vlogo. Kasneje je igrala v glavnem blede spogledljivke in razuzdane plemkinje (npr. film Tropi cof Cancer iz leta 1969). Zadnjič je nastopila v filmu leta 1972. Na znamki F-2570 je ona in Raimu v filmu La femme du Boulanger Marcela Pagnola. French stage actress Ginette Le Clerc (born as Geneviève Lucie Menut) began her film career in 1937. She hit her stride in the 1940s with such films as Le Corbeau (1942) and Il Fiacre N. 13 (1947), in which she played a triple role. In later years, she specialized in portraying faded coquettes and dissipated aristocrats in films like Tropic of Cancer (1969). Ginette LeClerc's final film appearance was in 1972. On stamp F-2570 she is with Raimu in film La femme du boulanger of Marcel Pagnol. Znana tudi kot Catharina de Berghes ten Essendelle je bila nizozemska junakinja v 80-letni vojni proti Španiji. Vodila je skupino žensk v uničenje osovraženega gradu Vredenburg, ki je bil simbol španske oblasti in iz z njega pregnala Špance. Na neki sliki iz začetka 17. stoletja je upodobljena oborožena s krampom. She is also known as Catharina de Berghes ten Essendelle was a heroine was a Dutch heroine of the Eighty Years' War against Spain. This heroine of Utrecht led a group of women in the destruction of the much-hated Vredenburg, a castle that was the symbol of the Spanish rule that had been driven out. She was angered by the fact that the new rulers did not dare to take this step. She has always appealed to the imagination. In the early seventeenth century, she was depicted armed with a pickaxe. In epic poems about Trijn, poetic licence embellished the legend even further. Nemška operna pevka je debirala 1910 v Hamburgu v Wagnerjevi operi Rensko zlato. Nastopala je na Dunaju, Salzburgu, Londonu in ZDA. Po priključitvi Avstrije tretjemu rajhu je emigrirala v ZDA, dobila je ameriško državljanstvo. Po koncu kariere se je ukvarjala s pedagoškim delom in režijo. Po glasu je bila lirsko-dramatični sopran, sicer pa specialistka za dela Wagnerja in Straussa. One of the most acclaimed lyric-dramatic sopranos of her time,German-born Lotte Lehmann, excelled in the operas of Richard Strauss, particularly in the role of the Marshallin in Der Rosenkavalier. She made her debut at the Hamburg Opera in 1909 and was a principal singer with the Vienna Opera from 1914 to 1938. There she created the roles of the composer in Ariadne auf Naxos and the dyer's wife in Die Frau ohne Schatten, both by Strauss. Lehmann sang at the Metropolitan Opera from 1934 to 1945, mostly in Wagnerian roles, and settled in California in 1938, following Hitler's annexation of Austria. She was an excellent pedagogue, and her master classes were attended by such singers as Marilyn Horne and Grace Bumbry. Lehmann's writings include the auto-biographical volumes Midway in My Song (1938), My Many Lives (1948), and Singing with Richard Strauss (1964). Käthe Leichter se je kot Marianne Katharina Pick rodila na Dunaju. Kot socialna demokratka je bila posebno aktivna na področjih ženske politike, družine in njihovih zakonitih načel. Ko so nacisti zasedli Avstrijo je Käthe Leichter zaradi svojega delovanja postala njihova žrtev. 30 maja 1938 jo je aretiral Gestapo. Odpeljali so jo v koncentracijsko taborišče Ravensbrück, kjer je februarja 1942 umrla. Käthe Leichter was born Marianne Katharina Pick in Vienna. As a Social Democrat she was especially active in issues concerning feminist politics, family, and the legal principles connected to them. Käthe Leichter fell victim to the tyranny put into practice during the National Socialist take-over in Austria. On May 30, 1938 she was arrested by the Gestapo and in 1940 transferred to the Ravensbrück concentration camp where she died. Finska zdravnica je diplomirala leta 1897 in doktorirala 1908. Specializirala se je za ginekologijo in postala profesorica za ginekologijo in porodništvo na univerzi v Helsinkih. Je prva ženska profesorica medicine na Finskem in v celi Skandinaviji. Finnish physician who graduated in 1897. Took her Doctorate of medicine 1908. Specialised in gyneacology 1913, becoming Professor of Gyneacology and Obstetrics at Helsinki University 1930-38. With the support of the women in Finish goverment she established a gyneacological hospital the Naistenklinikka in Helsinki. She was the first female professor of medicine in Finland and in all of Scandinavia. Družba sester Hčerke Božje ljubezni, ki jo je leta 1868 na Dunaju ustanovila Franciska Lechner, je začela 1882 delovati v Sarajevu. Samostan Marijin dom na Palah je bil odprt 1911. Vojnega leta 1941 se je tu znašlo pet sester: Jula Ivanišević, Berchmana Leidenix, Krizina Bojanc, Antonija Fabjan in Bernadeta Banja. 11 decembra so jih četniki nasilno odpeljali proti Goraždu, samostan pa oplenili in požgali. Po štirih dneh v mrazu in snegu so prišle v Goražde. Tam so četniki vdrli v njihovo sobo. Sestre so v obrambo svojega človeškega dostojanstva poskakale skozi okno. Četniki so poškodovane nune ubili in zmetali v Drino. Sestro Berchmana, ki so jo zaradi onemoglosti med potjo pustili v v Sjetlini, so ubili osem dni kasneje. 24.septembra 2011 so bile proglašene za blažene. The sisters of the Daughters of Divine Charity, which were established in Vienna in 1868 by Franciska Lechner, began its work in 1882 in Sarajevo, where the nuns came at the invitation of Archbishop Josip Stadler. At the Convent of Saint Mary’s Home in Pale, opened in 1911, the 1941 war has caught five sisters: Jula Ivanišević, Berchmana Leidenix, Krizina Bojanc, Antonija Fabjan and Bernadeta Banja. On the 11 December Serbian fighters chetniks looted the house, burned it down and forced five sisters to walk in the direction of Goražde Their four-day way of the cross at freezing temperatures and snow, along with the interrogations, has led to Sjetline, where the 76-year old Berchmana, exhausted from the walk and all the events, was separated from the group and forced to remain behind. Other sisters reached Goražde on 15 December 1941 and were placed in the military barracks on the 2nd floor. On the same evening, the chetniks broke into the room with the impure intentions and assaulted them. In defense of their human dignity, sisters broke loose from hands of their attackers and one by one jumped out through the window. The cetnicks have killed injured nuns with knives and thrown their bodies into the River Drina. Sr. Berchmana was killed eight days later, on 23 December in Sjetlina. Angleška filmska in gledališka igralka s pravim imenom Vivian Mary Hartley je najbolj znana po vlogi Scarlet O`Hara v filmu V vrtincu, za katero je dobila oskarja. V filmu Fire over England je igrala skupaj z Laurencem Olivierjem s katerim se je leta 1940 poročila. Skupaj sta nastopala v številnih igrah (v Cesarju in Kleopatri Bernarda Showa in številnih Shakespearjevih delih). Za vlogo v filmu A Streetcar Named Desire je dobila leta 1951 drugega oskarja. Igrala je v številnih drugih filmih: Waterloo Bridge (1940), That Hamilton Woman (1941), The Deep Blue Sea (1955), The Roman Spring of Mrs. Stone (1961), Ship of Fools (1965). The British stage and film actress Vivien Leigh, originally named Vivian Mary Hartley , is best remembered for her Academy Award winning performance as Scarlett O'Hara in the film Gone With the Wind (1939). After gaining attention in the theater, Leigh was cast opposite Laurence Olivier in the film Fire Over England (1937). They were married in 1940 and appeared together in numerous plays, notably George Bernard Shaw's Ceasar and Cleopatra and several Shakespearian productions. Leigh won acclaim for her portrayal of Blanche Du Bois in the London staging (1949) of Tennessee Williams' A Streetcar Named Desire, and repeated her success in the film (1951) version, for which she won her second Academy Award. Her other films included Waterloo Bridge (1940), That Hamilton Woman (1941), The Deep Blue Sea (1955), The Roman Spring of Mrs. Stone (1961), and Ship of Fools (1965). Španska pisateljica znana tudi pod psevdonimom Martinez Sierra, ki je bil priimek njenega moža pisatelja Gregoria Martíneza Sierra. Bila je bila plodovita pisateljica. Napisala je več kot kot sto romanov, dram, esejev, pesmi in filmskih scenarijev. Vsa njena dela so bila objavljena pod imenom njenega moža, ki je šele čez leta javno priznal kdo je avtor del. Po poklicu je bila učiteljica v osnovi šoli. Leta 1933 so jo izvolili kot predstavnico Granade v parlament. She is also known by her pseudonymous Maria Martinez Sierra the surname of her husband writer Gregorio Martínez Sierra. She was a prolific writer of over more than hundred novels, plays, essays, poetry and film scripts although all her work was published under her husband’s name who was compelled over the years to publicly recognise his wife as the true author. She was a primary school teacher and in 1933 was elected a member of the Parliament of the Republic representing Granada. Švedska pesnica je prve pesmi objavila pri 18. letih. Leta 1780 se je poročila s Carlom Lenngrenom, ustanoviteljem in pozneje urednikom vplivnega časopisa Stockholms Posten kjer je aninimno objavljala. Ni se smatrala za poklicno pisateljico ampak za običajno fizično osebo, gospodinjo. Svoja najboljša dela je napisala v letih 1790-1999. Najbolj znane so nene idile Den glada festen (1796) in Pojkarne (1797). Swedish poet began to publish poetry at age 18. In 1780 she married Carl Lenngren, founder and later editor of the influential Stockholms Posten, to which she thereafter contributed anonymously. Insisting that she was a private individual, a housewife rather than a professional writer, Lenngren remained modest about her literary accomplishments. Her best work was written in the 1790s. Her most famous idylls are Den glada festen (The Merry Festival, 1796) and Pojkarne (The Boys, 1797). Belgijska modna oblikovalka deluje v Parizu kjer je ustanovila konfekcijsko družbo pod svojim imenom. Belgian fashion designer based in Paris and founder of the ready-to-wear company that bears her name. Italijanska nevrologinja je leta 1986 skupaj s Stanley Cohen dobila nobelovo nagrado za medicino za odkritje živčnega rastnega faktorja. Od leta 2001 je bila dosmrtna senatorka v italijanskem senatu. Kot prva nobelovka je presegla starost 100 let. Rita Levi-Montalcini was an Italian neurologist who, together with colleague Stanley Cohen, received the 1986 Nobel Prize in Physiology or Medicine for their discovery of nerve growth factor (NGF). Also, from 2001, until her death, she served in the Italian Senate as a Senator for Life. She had been the oldest living Nobel laureate and the first ever to reach a 100th birthday. Članica francoskega odporniškega gibanja. Leta 1941 jo je aretiral gestapo, nekaj časa je bila zaprta v Franciji. Nato so jo deportirali v Nemčijo, kjer so jo obsodili na smrt. Posmrtno so jo odlikovali z medaljo odpora in vojnim križcem s palmami. A French school teacher of Jewish origins. During World War II she became a member of the French Resistance, was arrested and was later executed. She received several posthumous honors. Belgijska odbojkarica članica belgijske reprezentance je leta 2014 igrala za Atom Trefl Sopot. BIla je članica belgijske reprezentance na FIVB svetovnem prvenstvu leta 2014 v Italiji. A Belgian female volleyball player, a member of the Belgium women's national volleyball team and played for Atom Trefl Sopot in 2014. She was part of the Belgian national team at the 2014 FIVB Volleyball Women's World Championship in Italy. Nizozemska slikarka je slavna po svojih žanrskih delih. Njene teme segajo od živahnih glasbenikov do spokojnih domačih prizorov. Njena dela razkrivajo tesno povezavo z deli svojega sodobnika Fransa Halsa. To lahko vidimo v delih: The Merry Drinker (1629) in v The Serenade (1629). Deli sta v Rijksmuseumu v Amsterdamu. Bila je članica ceha Sv. Luke in učiteljica slikarjev. The Dutch painter Judith Leyster, achieved fame for her genre works. Her subjects range from animated musicians to quiet domestic scenes. Their execution reveals a close affinity with the work of her contemporary Frans Hals, as in The Merry Drinker (1629) and The Serenade (1629), both in the Rijksmuseum, Amsterdam. Leyster was elected to the Guild of St. Luke and was a teacher of painters. Finska atletinja - metalka kopja je bila v 80 letih ena najboljših metalk kopja. Na svetovnem prvenstvu v Helsinkih leta 1983 je osvojila prvo mesto, na OI 1984 pa srebrno medaljo. Dvakrat je bila svetovna rekorderka (1982 in 1983). She is a former Finnish javelin thrower, who was among the best female javelin throwers in the world in the early and mid 1980s. She won gold medal in 1983 on World Championships in Helsinki and a silver medal in 1984 OG. Two times she was world recorder (1982 and 1983). Švedska pisateljica se je rodila 1958 v Ångermanland na severu Švedske. Po študiju na Nyckelviksskolan (umetnosti, obrt in oblikovanja) in na inštitutu za novinarstvo je delala kot novinarka, vodja restavracije in negovalka. Od leta 1993 živi na otoku Lappo v arhipelagu Åland in se posveča samo pisanju. Piše leposlovne knjige za otroke in mladino. Njena serija Peščenem volku in njegovemu prijatelju Zackarina je prevedena v 10 jezikov. Na znamki Aland-324 je ilustracija iz njene knjige: Več o peščenem volku. Author Åsa Lind was born in 1958 in Ångermanland in northern Sweden. After studies at Nyckelviksskolan (art, craft and design) and at the Institute of Journalism, she worked as a journalist, a restaurant manager and a nursing assistant. Since 1993, she lives on Lappo in the Åland archipelago, where she works fulltime as an author. Åsa writes both fiction and non-fiction books for children and youth. Her series about the Sand Wolf and his friend Zackarina has been translated into 10 languages. 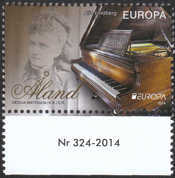 On stamp Aland-324 is her ilustration from her book: More of the Sand Wolf. Švedska operna pevka s pravim imenom Johanna Maria Lind je debitirala je 1838 v Stockholmu z vlogo Anchen v operi Čarostrelec. Mednarodni sloves je dosegla kot koloraturna sopranistka z izjemno velikim glasovnim obsegom (od malega b do tri črtanega g). Imenovali so jo švedski slavček. Razmeroma kratko kariero je zaključila 1849. Danski pisatelj Andersen ji je posvetil pravljico Cesarjev slavec. Jenny Lind, was one of the most celebrated singers of her time. Between 1838 and 1849 she appeared at every major opera house in Europe and was known by her adoring public as "the Swedish nightingale." In 1850 she was brought to the United States by the circus impresario P.T. Barnum. The American public thronged to her recitals, and writers penned poems in her honor and newspaper articles by the hundreds. She left the United States in 1852 with a newly acquired fortune (most of which she donated to charities in Sweden) and a husband, her German accompanist Otto Goldschmidt. In 1856 she settled in England, where she continued her concert career until 1870. She also taught at the Royal College of Music. Alandska pianistka je začela igrati klavir pri 5 letih. Glasbo je študirala v Helsinkih in Nemčiji. Alie Lindberg an Åland pianist started playing at the age of five. She studied music in Helsinki and in Germany. Švedska pisateljica je prva je delala kot uslužbenka v založbi. Leta 1944 je opozorila nase s prvo knjigo za dekleta in z odrsko kriminalko. Mednarodno slavo je dosegla kot otroška pisateljica s knjigo Pika Nogavička (1945-46), v kateri je nanizala dogodivščine drobne pegaste deklice s čudežno močjo, ki se z navihanostjo in čudaškimi domisleki upira svetu odraslih. Ta knjiga je po slogu in pristopu pomenila prelomnico v otroški literaturi. Pomembnejša dela: Detektivski mojster Blomkvist (1946), Erazem in potepuh (1957), Kljukec spet leti (1962), Ronja, razbojniška hči (1981). RU-237: Karlson and Eric on Roof. She is the most read writer in Sweden. She made her debut in 1945 with Pippi Longstocking. 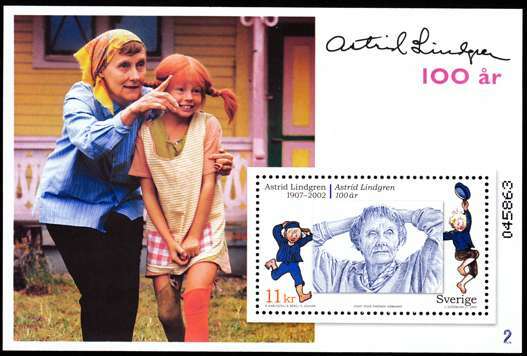 Astrid Lindgren´s books have been translated into some sixty languages, and the have generated plays, films, and TV series all over the world. Švedsko političarko - zunanjo ministrico je umoril 25. letni Šved srbskega porekla Mijailo Mijailovic. She was swedish minister of foreign affairs murdered by Mijailo Mijailovic, a 25-year-old Swede of Serbian parentage. Nemška komunistka hči rudarja se je leta 1929 pridružila socialistični mladinski organizaciji Die Falken (Sokoli). Potem ko so Sudete okupirali Nemci, je Lindnerjeva odšla v ilegalo in je od leta 1939 delala kot prodajalka v Dresdnu. Leta 1941 so jo aretirali skupaj z očetom. Naslednje leto sta skupaj čakala na sojenje v zaporu v Bruxu. Skupaj z več drugimi je bila leta 1942 obsojena na smrt zaradi izdelave in distribucije komunističnih letakov, zaradi pomoči sovražniku in priprave na veleizdajo. Obsodba je bila izvršena v zaporu Plötzensee v Berlinu. German communist was a miner's daughter. In 1929 she joined the socialist youth organization 'Falcons' (Die Falken). After the Sudetenland had become a part of Germany Lindner went underground and from 1939 on worked as a salesgirl in Dresden. In 1941 Lindner was arrested together with her father. The next year they both spent in Brüx prison while awaiting their trial which was held in Berlin. Together with several other defendants she received the death sentence on Nov. 23rd, 1942 for producing and distributing communist leaflets, helping the enemy and preparation for high treason. She was executed in Berlin's Plötzensee prison in 1943. Romunska športnica, veslačica je na vseh OI od 1984 do 2004 osvojila skupaj pet zlatih, dve srebrni in eno bronasto medaljo v kar 4 disciplinah: osmercu, dvojnem četvercu, dvojnem dvojcu in enojcu. 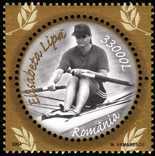 Romunian rower is the most decorated rower in the history of the Olympics, winning five gold, two silver and one bronze medals from 1992 to 2004. She holds the record amongst rowers for the most years between gold medals, at 20 years. Johanna in Žanis Lipkes sta med drugo svetovno vojno v okupirani Latviji rešila vsaj 55 židov pred koncentracijskim taboriščem. Judje so ga počastili z nazivom Pravični med narodi. Ta naziv so ustanovili leta 1953. Johanna and Žanis Lipkes saved the lives of at least 55 people in the Nazi-occupied Latvia during the Second World War. Žanis was honoured as one of the Righteous among the Nations, established in 1953. Moldavska operna je obiskovala dekliško gimnazijo v Kamenets Podolsk. Šolala se je na kraljevem konservatoriju v Petersburgu (1903-1906) in se izpopolnjevala v La Scali v Milanu (1906-1907). Pela je na opernih odrih v Parizu, Varšavi, Kišinjevu, Dunaju, Rostovu, Tokiu, Rimu, Pekingu, New Yorku, Londonu pod vodstvom slavnih dirigentov, kot so Otto Klemperer, Arturo Toscanini, E. Massini, A. Couts, NK Mal. Bila je izmed opernih zvezd iz začetka dvajsetega stoletja, znana po svoji brezhibni tehniki, glasu in brezhibnem odrskem nastopu. Moldovian opera singer studied in Gymnasium for girls Kamenets Podolsk. It pursues the course of the Imperial Conservatory of Petersburg (1903-1906) perfected it at La Scala of Milan (1906-1907). She sang on the stages of opera in Paris, Warsaw, Chisinau, Vienna, Rostov, Tokyo, Rome, Beijing, New York, London and under the direction of major conductors like Otto Klemperer, Arturo Toscanini, E. Massini, A. Couts, N. K. Mal. Lipovska was one of the opera stars of the early twentieth century, noted for his impeccable technique, her voice and her impeccable stage presence. Norveškega igralka delala od 1985-1988 na Statens Lærerhøgskole. Od leta 1988 pa je zaposlena v Norveškem gledališču. Za film Srce bojevnika je leta 1992 dobila nagrado Amanda in nagrado norveškega gledališča Schleiber. Mednarodno je postala prepoznavna s filmom Barbara (1997). Nekateri prizori iz tega filma so na znamkah Faroe-322/325. Norvegian actress worked at Statens Lærerhøgskole from 1985-1988. Employed full-time at The Norwegian Theatre since 1988. She got Amanda Award for Heart of the Warrior 1992, and The Norwegian Theatre's Schleiber Award the same year. International breakthrough with film Barbara (1997). 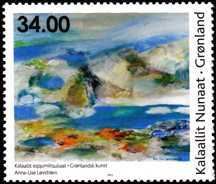 Some scenes are on stamps Faroe-322/325. Roksolano s pravim imenom Nastia Lisovska so kot mlado dekle leta 1520 ugrabili Krimski Tatari in jo prodali kot sužnjo. Kupil jo je turški sultan Sulejman I za svoj harem. Zaradi svoje osebnosti in inteligence je postala sultanova edina žena. Velikokrat je svetovala možu pri državnih zadevah. Pokopana je v bogato okrašenem grobu ob sultanovem v mošejskem kompleksu "Sulejnamija". Roksolana, known as Nastia Lisovska . As a young girl, she was captured in 1520 by Crimean Tartars, she was sold into slavery. She was bought by the Ottoman sultan Suleyman I Canuni for his harem. In the harem, she was given the name Roksaliana. Because of her personality and intelligence, the sultan made Roksoliana his only wife. She frequently consulted her husband on various matters of state. She is buried in an ornate tomb next to sultan Suleyman's Tomb, in the "Suleimania" mosque complex. Švicarska grafičarka je oblikovala logo za mednarodno leto družine 1994. Swiss artist designer of logo for the 1994 International Year of the Family. Joan Littlewood a theatre director and writer revolutionised British theatre after the Second World War by making the classics immediate and by turning raw material relevant to its time into productions of international acclaim. Chief among them was the eye-opening First World War entertainment Oh What a Lovely War, which (together with A Taste of Honey and Fings Ain’t Wot, They Used T’Be) was created in close collaboration with her actors. Littlewood was born in a working-class district of south London. She left the Royal Academy of Dramatic Art early, and with Jimmie Miller (later known as Ewan MacColl) she founded the agit-prop-inspired Theatre Union in Manchester. After the Second World War, aiming to bring a fresh kind of theatre to a new audience, the company toured the UK and Europe as Theatre Workshop before settling in 1953 at the run-down Theatre Royal in London’s East End. With the guidance of Littlewood’s partner, Gerry Raffles, came hard-won recognition. Littlewood, wanting to release everyone’s innate potential, also dreamed of a place for learning and entertainment: The Fun Palace. Her ideas for this project governed the rest of her life. After the death of Raffles in 1975, Littlewood left theatre and wrote books, dividing her time between France and England. Madžarska plavalka je skupaj z Ilono Novák, Judit Temes in Évo Novák osvojila zlato medaljo na OI 1952 v Helsinkih v štafeti 4 x 100m prosto. Na bloku H-5319 so še: Valéria Gyenge, Ágnes Keleti, Margit Korondi, Éva Székely, Ilona Novák, Judit Temes, Éva Novák and Katalin Szőke. She is a former swimmer from Hungary. With Ilona Novák, Judit Temes and Éva Novák she won gold medal on 1952 Summer Olympics in Helsinki - swimming, Women's 4 x 100 metres Freestyle Relay. On sheet H-5319 are also: Valéria Gyenge, Ágnes Keleti, Margit Korondi, Éva Székely, Ilona Novák, Judit Temes, Éva Novák and Katalin Szőke. Ukrajinska pevka, plesalka, skladateljica, dirigentka in pianistka je leta 2004 zmagala na Pesmi Evrovizije. Glasbeno se je začela izobraževati že pri štirih letih na eksperimentalni glasbeni šoli. Nastopala je z vokalno instrumentalnim ansamblom Horizon, kjer je njena mati pela. Leta 1994 je na ukrajinskem festivalu pop glasbe dobila veliko nagrado. Leta 1996 je zmagala na pevskem festivalu Slavyansky Bazar. Ukrainian singer, dancer, producer, composer, conductor, and piano player. She was also the winner of the Eurovision Song Contest 2004 with a song Wild Dances. From the age of 4, she was studying at an experimental musical school, at the same time performing her numbers in a vocal-instrumental band Horizon, in which her mother, a professional musician, had been singing. Ruslana started her career as a winner of Slavyansky Bazar song competition in 1996. She won the Grand Prix of the All-Ukrainian television festival of pop music Melody - 94. Italijanska policistka, osebna stražarka sodnika Paola Borsellina, borca proti sicilijanski mafiji je bila ubita ob eksploziji avta bombe, ki jo je mafija nastavila v Palermu. She was Italian police bodygard of sicilian anti-mafia magistrate Paolo Borsellino and was killed with four police officers by a car bomb attack of Mafia in Palermo. She was awared with gold medal for civil bravery. Italijanska filmska igralka je začela kot fotomodel. Po letu 1947 je nastopila v manjših filmskih vlogah. Uspela je šele v filmu Lepotice noči (1952). V petdesetih in šestdesetih letih 20. stol. je bila v Italiji in Evropi zelo priljubljena. Pomembnejši filmi: Fanfan Tulipan (1952), Kruh ljubezen in domišljija (1953), Najlepša ženska na svetu (1955), Trapez (1956), Pinokijeve dogodivščine (1972). Francoska pianistka in učiteljica je študirala pri Henruju Fissotu na Pariškem konzervatoriju, kjer je v letih 1906 do 11940 tudi poučevala. Leta 1943 je skupaj z violinistom Jacquemon Thibaudom ustanovila madnarodno teknmovanje za violiniste in pianiste Marguerite Long-Jacques Thibaud International Competition, ki se odvija vsako leto v Parizu. French pianist and teacher studied with Henri Fissot at the Paris Conservatoire, where she taught from 1906 to 1940. In 1943 she and violinist Jacques Thibaud established the Marguerite Long-Jacques Thibaud International Competition for violinists and pianists, which takes place each year in Paris. Ena najbolj znanih portugalskih modnih oblikovalk se je rodila na Madeiri, kjer je delala kot turistična vodička. Leta 1990 se je preselila v Lizbono, kjer je odprla butik Versos, ki ga je kasneje preimenovala v Fatima Lopes. S tem se je rodila njena blagovna znamka. Svoje kolekcije je razstavljala v Lizboni in Parizu. V Parizu je odprla svojo prvo trgovino v tujini. Leta 2003 pa prvi butik v ZDA. One of the best-known Portuguese fashion designers. She was born on Madeira island and worked as a tourist guide. n 1990 she moved to Lisbon, where she opened boutique "Versos". Later boutique was renamed to "Fatima Lopes" and Fatima Lopes brand was born. She began to exhibited her collections in Lisbon and Paris where she opened her first international store. In 2003 she opened her first brand store in the USA. Magyar protestant worker and educator. She was the wife of György Rákóczi I, prince of Transylvania.and assisted her husband in his successful struggle to introduce Protestant reforms into the Transylvanian church. Under her influence Comenius, the greatest religious teacher of the century took up residence in Sárospatak. She founded or sponsored several educational establishments , notably the Reformed College at Sárospatak. Italijanska filmska igralka je začela svojo karieor je kot fotomodel. Leta 1952 je odigrala svojo prvo večjo vlogo. Ko je spoznala producenta C.Pontija (z njim je poročena) je dobila več vlog. Kasneje je odigrala več psihološko poglobljenih vlog. Pomembnejši filmi: Neapeljsko zlato (1954), Črna orhideja (1958), La ciociara (1960), Zakon po italijansko (1964), Grofica iz Hong Konga (1966), Sončnice (1969). Za vlogo v La ciociara je prejela oskarja. Na znamki BG-4187 je tudi Liza Minelli. Beautiful, sensuous, and stately, the Italian film star Sophia Loren, born Sophia Scicolone, first came to international attention in Woman of the River (1955). Quickly adopted by Hollywood for such films as The Pride and the Passion (1957), Desire Under the Elms (1958), and El Cid (1961), Loren enjoyed greater critical success in the Italian comedies Yesterday, Today and Tomorrow (1963) and Marriage Italian Style (1964) and in the dramatic roles afforded by The Key (1958), Two Women (1961), for which she won an Academy Award, and A Special Day (1977). Since 1957 she has been married to producer Carlo Ponti. In 1991 she was awarded an honorary Oscar. On stamp BG-4187 is also Liza Minelli. Judovska pisateljica se je rodila v Nemčiji. Pred nacisti so leta 1930 zbežali v Anglijo od tam pa leta 1934 na Portugalsko, kjer je leta 1935 pridobila portugalsko državljanstvo. Leta 1943 je izdala svojo prvo knjigo Svet, v katerem sem živel in od takrat je svoje življenje posvetila prevajanju in književnosti za otroke in mladino. Sodelovala je v različnih časopisih in revijah. Leta 1998 je prejela Grand Prix Chronicle, EPA (portugalsko združenje pisateljev) za svoje delo. Jewish writer was born in Germany. In 1930 she fled to England from there in 1934 in Portugal, where in 1935 acquired Portuguese nationality. In 1943 she published her first book "The world in which I lived," and since then she has devoted her life to translation and literature for children and youth. She has participated in various newspapers and magazines. In 1998 she received the Grand Prix Chronicle (EPA Portuguese writers' association) for her work. In 1986 she graduated as a teacher from college in Nuuk Greenland. She is a self-taught artist and has read books to obtain her painting skills. She began with graphic forms and designs inspired by the Greenlandic legends and myths. Two subjects, the mask and the animal, have had a particular significance for Anne- Lise. Britanska paraolimpijska jadralka ja na paraolimpijskih igrah leta 2012 v Londonu osvojila zlato medaljo v kategoriji 2.4mR, kar je bila prva britanska paraolimpijska medalja v jadranju. She is a British Paralympic sailor. In Paralympic Games 2012 in London she won gold in the single-person 2.4mR, the Great Britain first ever Paralympic sailing medal. She is one of the outstanding German female politicians of the 20th century. Owing to her intelligence and her self-confidence, she succeeded in being admitted to the "Abitur" (school-leaving examination qualifying for university entrance) after several years of voluntary social work and subsequently studied political science. In 1912, the degree of Dr. rer. pol. was conferred on her as the first woman in Germany. In her capacity as social expert, she was entrusted with various socio-political tasks during the First World War. Before the war, she had already joined the bourgeois feminist movement and subscribed to (left-wing) liberalism. From 1919 onwards, she represented the German Democratic Party in the Reichstag. Because she was a vehement opponent of national socialism, a prohibition of publication and speech was imposed on her in 1933; this was followed by interrogations and a several months' arrest by the gestapo in 1937. After the war, she was head of the American military school in Oberammergau and from 1948 to 1950 head of the Office for Social Matters in Berlin. From 1953 to 1961, she represented the Free Democratic Party (FDP) in the Bundestag as whose president by seniority she acted several times. As a pioneer of the emancipation of women and of many social achievements, she received high honours, among others the honorary citizenship of Berlin. Bulgarian painter graduated from the State Art Academy, under Prof. Boris Mitov, in 1930. She soon won critical acclaim, joined a nonconformist art group called New Artists Union and played a key role in European artistic trends of the time. She is a Danish draughtsmand and graphic designer; education at Kunstakademiet in Copenhagen 1968-73. She makes large thoroughly prepared minute drawings of reality-fragments from walls to still-lifes and classical statues, where she shows the graphic alternation between light and shadow. 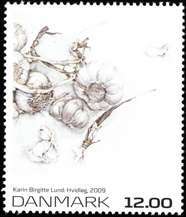 Karin Birgitte Lund won in 2007 the competition about the look of a new Danish bank note series. She was born 1947 in Kökar where she also spent all her summers. She lives and works as a writer in Porvoo, Finland. Lundberg made her literary debut at 15 with a collection of poems Starting point (1962). The whole body of her work comprises radio dramas, short stories, novels and documentary novels. She is best known for her so-called shipping trilogy issued 1989–1995, dealing with the Åland peasant shipping, ocean-going shipping and today’s ferry-services. Some of her most important latest pieces of work are: Sibiria A self-portrait with wings (1993), Rain (1997) and The marzipan soldier (2001). Ulla-Lena has been awarded a number of prizes, some of which being the Runeberg Award (1998) and the Swedish Academy’s Finlandia Award (1994). Her books have been translated into Finnish, Danish, German, Dutch and Russian. 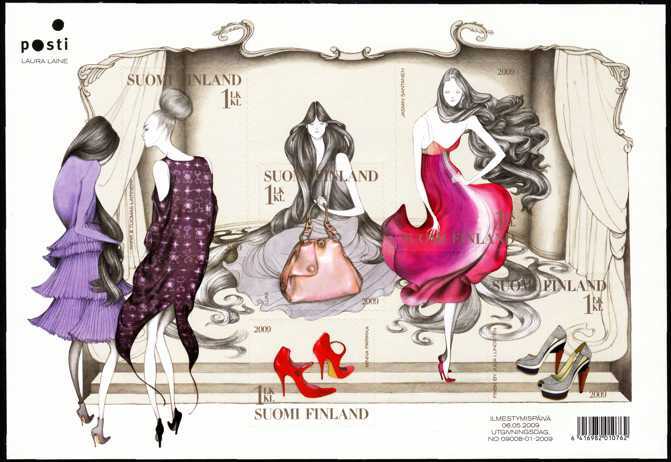 Finnish shoe designer. Her stylish signature wooden heels have won the admiration even of the king of shoe designers, Manolo Blahnik, who has called them “divine” and “perfect”. The wooden-heeled pump shown on the stamp is made of fish skin. Lundsten’s creations are sold in Tokyo, London, New York and other great cities. 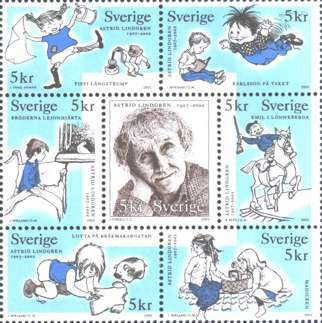 On sheet FI-1970-1974 are also Lundsten Juliasten, Parika Minna, Katola Sanna, Santanen Jasmin and Laitinen Anna. Beloruska gimnastičarka je na OI 2008 v Pekingu osvojila bronasto medaljo v ekipi ritmične gimnastike. Na znamki BY-819 je Aksana Miankova. Ne priveskih BY-blok-77 so ostale beloruske športnice prejemnice medalj na OI 2008 v Pekingu: Jekaterina Karsten, Inna Zhukova, Julija Bičik, Natalija Helakh, Natallia Mikhnevich, Nadzeya Ostapchuk, Nastassia Novikava, Alina Tumilovich, Anastasia Ivankova, Glafira Martinovich, Ksenia Sankovich, Olesya Babushkina. Belarusian gymnast competed at the 2008 Summer Olympics in Beijing where she received a bronze medal in the rhythmic team competition. 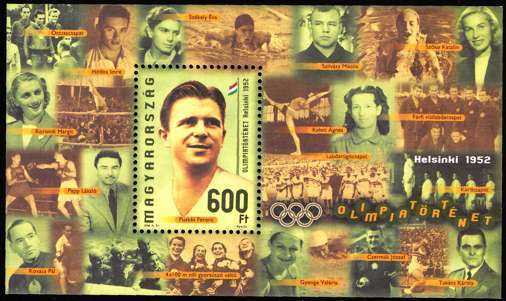 On stamp BY-819 is Aksana Miankova. 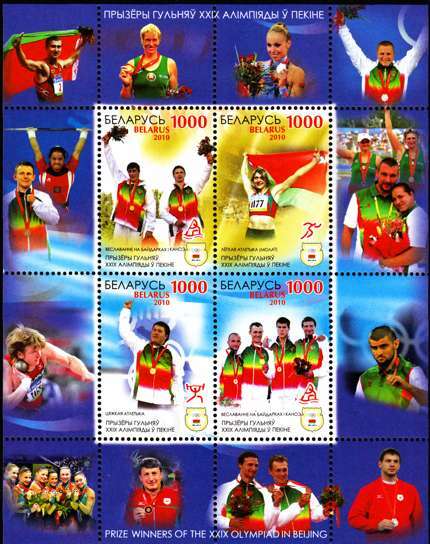 On labels of sheet BY-blok-77 are also other Belarus women winners of medals in OG Bejing: Jekaterina Karsten, Inna Zhukova, Julija Bičik, Natalija Helakh, Natallia Mikhnevich, Nadzeya Ostapchuk, Nastassia Novikava, Alina Tumilovich, Anastasia Ivankova, Glafira Martinovich, Ksenia Sankovich, Olesya Babushkina. Romunska plemkinja hčerka Vaila Lupuja. Leta 1652 se je poročila z Tymish Khmelnytskym. Po smrti moža je živela v mestu Raškiv v Podili in v Moldaviji. Njena poroka je opisana delu Horbaha Timiša: Khmel’nyts’kyi v rumuns’kii istoriohrafiï ta literaturi. She was Moldavian princess daughter of Vasile Lupu. She married Tymish Khmelnytsky in 1652. After his death in 1653, she lived in Chyhyryn; later she moved to an estate given to her by Bohdan Khmelnytsky, in the town of Rashkiv, in Podilia. In 1666 she returned to Moldavia. The details of her marriage are discussed in A. Horbach's Tymish Khmel’nyts’kyi v rumuns’kii istoriohrafiï ta literaturi. She was a Faroese graphical artist. Actually, she was the first professional Faroese with linocuts. Vodilna teoretičarka socializma in ustanoviteljica nemške komunistične partije. Rojena je bila v uspešni judovski družini v Rusiji, leta 1887 je začela z revolucionarnim delom. Leta 1889 so jo izgnali v Švico, kjer je pomagala ustanoviti (1893) internacionalno poljsko socialistično stranko. S poroko je pridobila nemško državljanstvo in postala voditeljica ekstremnega levega krila nemške socialno demokratske stranke. Aktivna je bila v drugi internacionali, kjer se je borila proti nacionalizmu. Zaradi revolucionarne aktivnosti med prvo svetovno vojno je bila v zaporu (1916 - 18), kjer je napisala Spartakovska pisma. Skupaj s Karlom Liebknechtom je 1916 ustanovila radikalno Spartakovo zvezo, iz katere ja 30.12.1918 nastala komunistična partija Nemčije. Skupaj z Liebknechtom jo je po neuspešnem uporu spartakovcev ubila nemška vojska. Njeno najpomembnejše delo je Akumulacija kapitala, kjer predstavlja svojo teorijo imperializma. Rosa Luxemburg leading socialist theorist and founder of the German Communist party. Born into a prosperous Jewish business family in Russian, she engaged in revolutionary activity from 1887. In 1889 she was forced into exile in Switzerland, where she helped found (1893) the antinationalist Polish Socialist party. Acquiring German citizenship by marriage, Luxemburg became a leader of the extreme left wing of the German Social Democratic party. She was active in the Second International, fighting the trend toward nationalism within the socialist movement. While in prison (1916-18) for revolutionary activity during World War I, Luxemburg wrote the so-called Spartacus Letters. With Karl Liebknecht she founded (1916) the radical Spartacus League, which, on Dec. 30, 1918, became the German Communist party. Both Liebknecht and Luxemburg were murdered by German troops after the abortive Spartacist uprising of January 1919. Luxemburg's chief work, presenting her theory of imperialism, was Accumulation of Capital (1913). Članica glasbene skupina ABBA, prvo skladbo People Need Love so izdali leta 1972, ko so se tudi poimenovali po začetnicah imen članov skupine (Anni-Frid Lyngstad, Bjorn Ulvaeus, Benny Andersson, Agneta Faltskog). S skladbo Waterloo so zmagali na evrovizijskem tekmovanju leta 1972 v Bringhtonu. S tem se je začelo njihovo obdobje velikih uspehov. V naslednjih letih so s skladbami Honey Honey, Mamma Mia, Money, Money, Money, Take A chance On Me, Knowing Me, Dancing Queen in drugimi osvojili poslušalce po celem svetu. Za njihove skladbe so značilni prijetna melodija, preprosta besedila in poudarjen ritem. Skupina sodi med komercialno najuspešnejše v zgodovini zabavne glasbe.